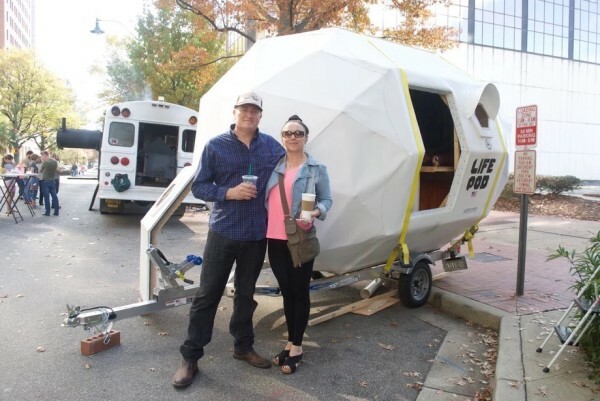 This is the geo-dome Life Pod travel trailer by Michael Weekes. Outside, you’ll see a geometric dome attached to what seems to be a small trailer for boats. When you go inside, you’ll find a bed, dinette, window, storage and a bathroom. The inside decor has light-colored wooden accents with exposed triangular beams. Our big thanks to Dan G. for sharing! You can share this Life Pod travel trailer with your friends and family for free using the e-mail and social media re-share buttons below. Thanks. If you enjoyed this travel trailer you’ll absolutely LOVE our Free Daily Tiny House Newsletter with even more! Thank you! At first sight it looks like a salvaged space capsule from an old Apollo mission. Funny in a good way but then when I see it in pic being towed by an old model ford or Mercury it becomes funnier , that coupled with the towing straps that have it hogged down to a peculiar trailer. A for effort at least. Doesn’t seem practical and yet maybe would look better suited to being suspended on 8″ tall aircraft aluminum legs like a pod treehouse of sorts . Park it in New Mexico at site 51 and charge tourists to stay overnight and you have yourself a business ! Ha, ha. Too funny! I love your outside the box thinking regarding the area 51 business. It would probably go over too. Then there’s Roswell. The pod, not my cup of tea but I always enjoy checking out most anything someone takes the time to create. Went to the RV show in hershey, pa last sept. There were a few mfrs. offering small pod like trailers made from fiberglass. They had enough room for a bed or couch/bed, small kitchen and a small bathroom. Some had the kitchen outside inside the pod area. Small but functional. This one looks like it may not be aerodynamic to tow but who knows. Cool experiment. Explore possibilities. Learn what works. Tinker aggressively. Expose yourself to discovery. That is the strangest thing I have ever seen being towed. Interesting. Build it and they will complain about something. I think it is a very good experimental design. I think Geo-Vardo could be a good name for this one. Testing new, unconventional designs is a human strength.